Yet again, unfortunately, we are forced to make an appeal for our Fighting Fund. This time it is for professional advice on the joint Runnymede/Spelthorne Strategic Housing Market Assessment, or SHMA. 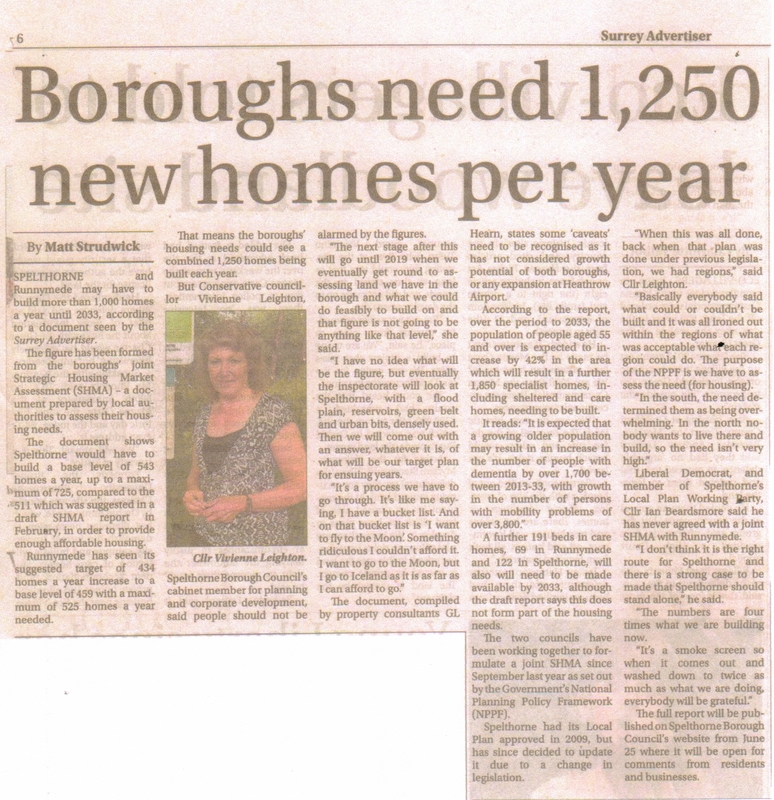 The draft SHMA report says that the two Boroughs will need to build 1250 dwellings, every year for the next twenty years, to satisfy the need for housing. 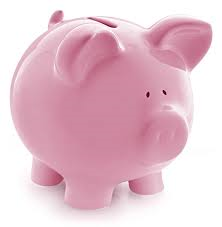 The lion’s share of this total would be built in Spelthorne. Building at such a rate will change the character of this Borough radically, and unalterably. It would have profound implications for neighbouring Boroughs. This report has to be challenged. 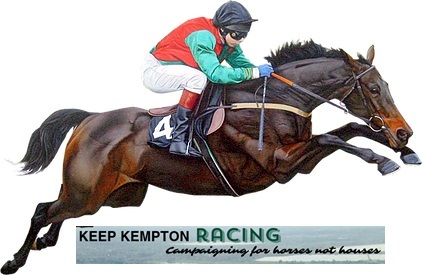 What does this have to do with the campaign to stop 1500-2000 dwellings being built on Green belt at Kempton Park? If the future housing targets in the Revised Local Plan are anything approaching the housing needs assessment in the SHMA, then preventing those Kempton Park houses (and protecting Green Belt and open spaces anywhere else in this and neighbouring Boroughs) will become very much more difficult. Unfortunately, time is extremely short. We have until 27 July to submit comments on the draft SHMA. It really says something about the state of local democracy when residents – not for the first time – are forced into this kind of dispute with their own Council. We wish it wasn’t so. But, more’s the pity, it is. LOSRA (the Lower Sunbury Residents Association) have kindly offered to receive and account for donations to this campaign. LOSRA have been around for more than 40 years, and have impeccable credentials with regard to accountability and reliability. If you would like to donate to the cause using PayPal, please click here . 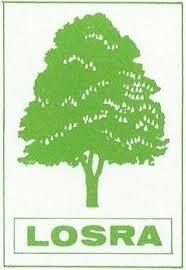 This will take you straight through to the LOSRA website’s home page. 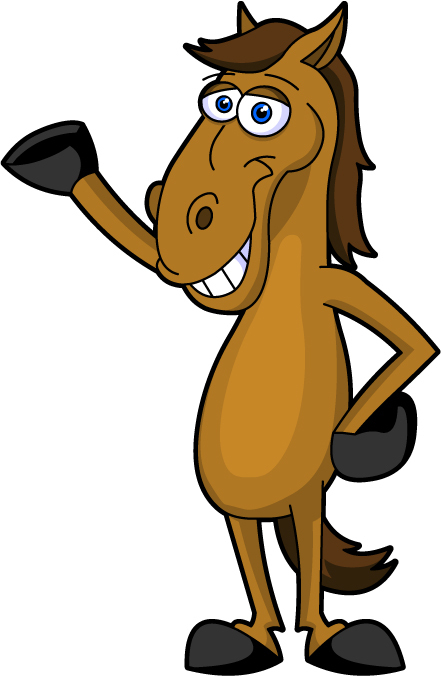 Scroll down and click on the button on the right: “Donate to the Keep Kempton Green Fund“. You will remember at the beginning of June that we made public the Final Draft Report by GL Hearn on Spelthorne’s Housing Needs, commissioned as part of the Review of the Local Plan. It had been considered at a meeting of the Local Plan Working Party which was closed to the public. (click here). That report (and a number of other reports on previous documents which have already gone out for public consultation) will be considered by the Spelthorne Cabinet on Wednesday next week. (ii) To NOT AGREE publication and stakeholder involvement of the draft Strategic Housing Market Assessment (SHMA) report. But the SHMA report isn’t included with the Cabinet papers. How can the Cabinet make a decision on a report which they haven’t seen? Are the Cabinet in the habit of writing blank cheques written by the Officers? Perhaps they are. But it’s not only laughable, it’s also in contravention of the law – to be precise, The Local Authorities (Executive Arrangements) (Meetings and Access to Information) (England) Regulations 2012. The SHMA report (which is a report commissioned jointly by Spelthorne and Runnymede) is also on the Agenda of the Runnymede Planning Committee at the same time on the same evening. Unusually for Runnymede – who usually make public these kind of documents at the earliest opportunity – the SHMA report isn’t included with their Committee papers either. 2.1 The Council and its HMA partner, Spelthorne Borough Council, are currently consulting on the final draft version of the SHMA. The four week consultation period began on 27 May and will conclude on 26 June. It is a focussed consultation with our Duty to Co-operate partners. As agreed at the most recent SHMA JMLG meeting, officers at the local authorities with which we are consulting have been advised that the document is for consideration by officers only at this stage and should not be released into the public domain. The document will be published on both Runnymede and Spelthorne’s websites following the conclusion of the consultation.” (our emphasis). So, Runnymede have withheld the report on the advice of officers from “other authorities”, which was agreed at the last meeting of the SHMA Joint Member Liaison Group (JMLG). Who attends that JMLG? Representatives from Spelthorne and Runnymede. We are not taking any further bets on which local authority advised Runnymede not to release the report to the public. 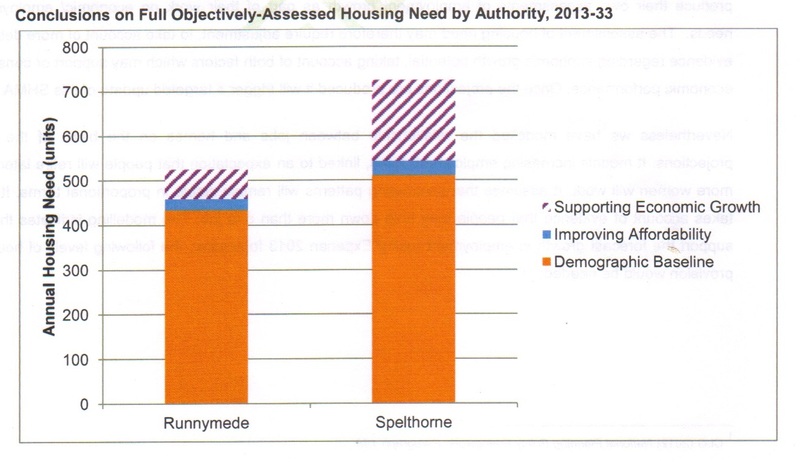 As if to ram the point home – and no doubt with totally unconscious irony – also on the Agenda at next Wednesday’s Cabinet meeting are the results of the 2014 Spelthorne Residents Survey. When asked whether residents were satisfied with Spelthorne as a place to live, 83% were satisfied – the worst result in Surrey. Only 73% were satisfied with the way the Council runs things. 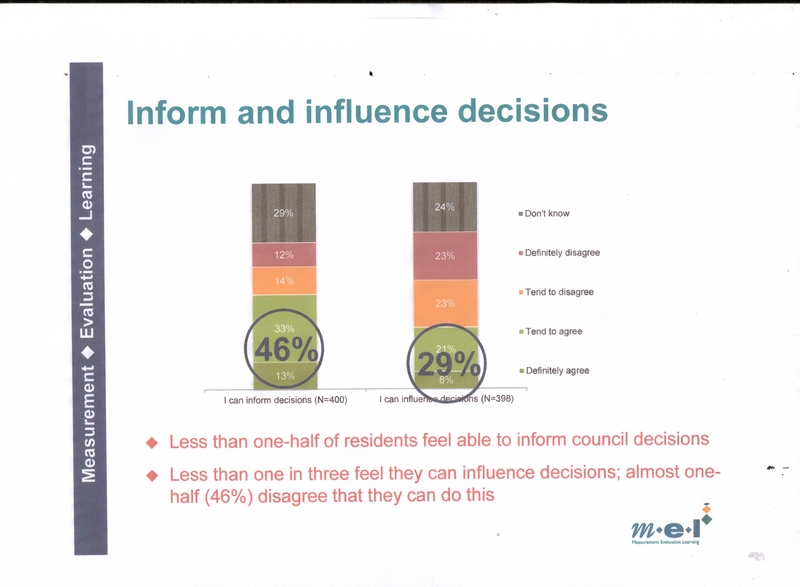 Only 45% thought the Council provides value for money, and less than a third thought they had any influence in Council decisions. Now that’s what’s called a democratic deficit. Perhaps the Council should connect the dots. It seems that, of the three Borough Councillors who have since last October been helping Surrey Police with their enquiries into the sale and development of the Bridge Street car park in Staines (see here and here), one councillor has been cleared and the other two are still being investigated. Above another page from Redrow’s Brief to Architects competing to design the planned new suburb at Kempton Park. 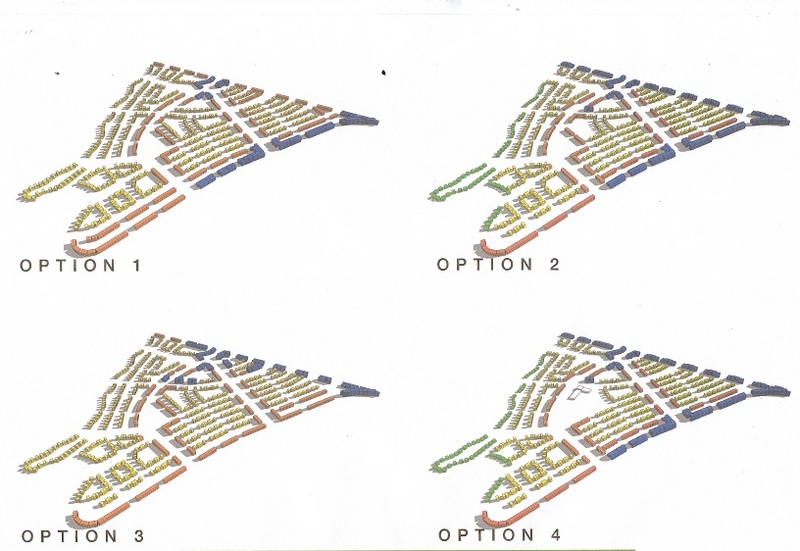 The image above shows layout options for the 1500 – 2000 dwellings mooted for the site. The aerial perspective viewpoint of each Option is from the north west of the site. Just the place to start satisfying the huge increase in housing the Council are contemplating. What price all the assurances now? Not for the first time matters fundamental to the future of the Borough are being discussed and decided behind closed doors. Not for the first time, documents from these meetings are being shared with other local authorities, but not with the residents of Spelthorne. As before, we have received a number of copies of the documents from people who view this issue, and the manner in which it is being kept secret, with concern. And so, also not for the first time, Spelthorne and other local authorities are proving to be more leaky than the Welsh Guards on St David’s Day. You will remember the last “leaked” document in September 2014, in which Spelthorne officials let it be known that Spelthorne’s housing targets were going to be raised from the current 166 dwelling p.a. to a minimum of 400 p.a. Voting was, we believe, along party lines. And the new housing figures? Not 400 p.a., but a range of between 543 p.a. and 725 p.a. That’s a more than four-fold increase on the current figure: 14 500 new dwellings over the 20 year life of OUR new Local Plan. Where are they going to put them? We’ll leave that to you to work out. Try looking at an open space near where you live, for starters. It seems there is a ratchet attached to these housing figures – they can only go up. What price all the assurances about Green Belt and Kempton Park now?